When the weather gets chilly, we often take cover under the blankets and wear layers of clothes to keep away the cold. Unfortunately, all attempts to keep warm may be futile if the room you are in is cold. Your living space can either keep you warm and cosy or leave you frozen. In Australia, most homes lack the right designs in their architecture to handle cold temperatures. Australian houses tend to lose a lot of heat, especially during cold weather. Numerous solutions have been employed by architects and interior designers to minimise heat loss and keep houses warm but none is greater than heaters. Heaters have a long history that dates back to the 15th century. Wood heaters were the first household heaters. They gained popularity during the industrial revolution of the 17th century but they had a number of problems that made them inefficient. Luckily, things changed with time. Compact and efficient wood heaters were developed. The search for alternative sources of fuel also led to the discovery of gas heaters and electric heaters. With different heaters in the market, the debate of which heater is better started. Currently, the more pressing question is which small to medium sized heater options are good? Old is gold, therefore it’s only fair to start with the modern medium-sized wood heaters available in the market. One of the leading brands in wood heaters is Arrow. Arrow wood heaters have acquired an unparalleled reputation due to their efficiency and sleek designs. The Arrow 2400 Freestanding wood heater is a medium-sized heater that is the favourite for many homeowners. Despite the size, the heater has good heat distribution attributed to the three- speed fan mechanism. The wood heater also has a triple burn combustion system that augments fuel efficiency and keeps the room clean. When it comes to looks, the Arrow 2400 wood heater does not disappoint. This wood heater has a stunning traditional styling that is certain to revamp your home. The build is sturdy and meets the highest construction quality standards. Get one today and you will certainly not regret it. When tradition meets innovation you get the Coonara Settler I600 inbuilt wood heater. 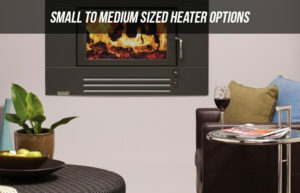 This is an Australian made and owned wood heater that is certain to make your living space cosy. The build of the heater not only meets the required standards but also adds to the beauty of the installation. The heater has a large viewing window for you to enjoy the beautiful dance performance of the burning flames. Moreover, the Coonara Settler 1600 has cast iron liners and a standard 3-speed fan. Although it comes in a standard charcoal colour, there are an array of bright colours available. The performance of the heater is remarkable with a 68% efficiency. Gas heaters are a wonderful selection for heating without the added effort that wood heaters bring. These are not only efficient but they also save on heating costs. Escea is a household name when it comes to gas heaters. The Escea DF700 inbuilt gas heater is one of the most popular models in the market. This gas heater has a well-crafted build that makes it an ideal heating solution for homes. The DF700 combines a minimalistic European style with the trending elegance of modern heaters. The simplistic appearance of the heater adapts to its surrounding, blending seamlessly with any indoor or outdoor space. You can control the Escea DF700 with your smartphone and enjoy a cosy room without any pollution. 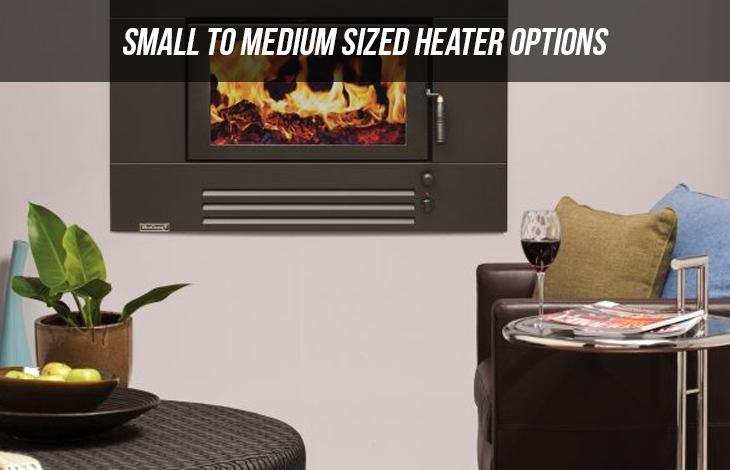 Lopi is known for making the best inbuilt linear gas fireplaces but they also have stunning small heaters. The Lopi Cypress GS2 is a freestanding gas heaters that has gained popularity among the Lopi products. The heater employs a contemporary design and has an option of a traditional log, pebble or sculptured driftwood media. The heater has 3-sided, ceramic glass, viewing panels that enhance heat distribution and offer an incredible view. The Lopi Cypress has the option of a top or rear vent. It also comes with a GreenSmart 2 remote control and accent lights. The heater can heat up 180 sqm of living space. So if you want something compact and efficient this is the heater for you. If you wish to enjoy portability and zero stress, an electric heater is your best bet. Electric heaters are yet to gain popularity but they still offer great heating solutions. Some models have outperformed popular wood and gas heaters, therefore it’s only a matter of time before they become famous. The Dimplex Lee Silver electric fire is a compact electric heater that is certain to impress. The heater has a sleek contemporary design with a silver finish. It runs a flame effect that can be used independently of the heat source. It comes with carrying handles, castors and LED low-energy effect logs. The heater is efficient and offers an enjoyable ambience. In conclusion, there are many options for small and medium-sized heaters in the market. The choice simply depends on your taste and needs. SO don’t get cold feet when choosing a heater, there is one for everyone.